Lake Blue Ridge at its finest! 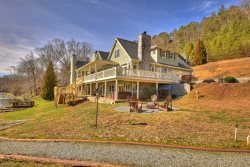 This stunning 5-bedroom vacation home is steps from one of the most pristine Lakes in North Georgia and minutes from Downtown Blue Ridge shopping and dining. Less than three miles from Downtown Blue Ridge, the Retreat is in perfect proximity to access great restaurants, shopping and 2 boat ramps to launch your boat. At the same time, Blue Ridge Lake Retreat is nestled on a point with a large private driveway with lovely natural landscape, lush green grass and beautiful crystal clear waters giving you the relaxing experience you dream of. The "modern and elegant" feel of this comfortable lakefront home will make time stand still. Luxury and class best describe the interior surroundings of the Main House. However, you might not want to spend much time inside. Instead, sit on the large covered back deck and watch your children run across the large level yard while you marvel at the incredible glow across the lake in the evening. Or, spend your days involved in the numerous activities Lake Blue Ridge has to offer. But your best option is probably to simply lounge on the dock and watch the boats in the distance skim across the water line. Whatever you choose, you will thoroughly revel in your experience at Blue Ridge Lake Retreat. Located less than 10 minutes from Downtown Blue Ridge shopping, dinning and night life. On lake Blue Ridge off Dry Branch Rd. to Eaton Rd. Entry Level bathroom is extremely spacious offering double vanity, jetted tub, walk in shower all with luxurious fixtures. Bedroom four offers a king bed and spacious private bathroom with double vanity and walk-in slate shower. Bedroom five has a king bed with parlor, table, and two chairs. Bedroom five has a private bathroom with walk-in slate shower and single vanity. Guests may bring their own canoe, kayak, paddle board and water toys. We will be back it was a beautiful house with all the amenities.